If you've been reading my blog during the past two months, then you know that I've been working with my 5yr old son to prepare him for kindergarten in the fall. 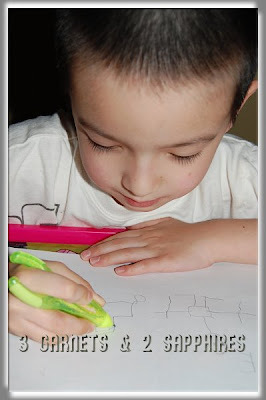 One of the things he is doing is practicing writing in a journal. Sometimes his printing is beautiful . . . neat and uniform. Other times, it's different sizes and unsteady. So what could be causing the difference (other than a 5yr old's attention span)? One thing that could be the source of the problem is which writing utensil he is holding. I noticed that he does much better with certain pens or markers over others. Depending on the shape and thickness of the pens and pencils, he tends to hold some too low, which is awkward, or he holds some too high, which gives him less control. So when I heard about the new ergonomic pencils from PenAgain, I wondered if they could help bring consistency to my son's handwriting. 1) Based on both my son's and my experience with trying these pencils, they do fit in the hand of an adult as well as a 5yr old child. I thought it felt very natural to hold this wishbone-shaped pencil. My son also said that he found them very comfortable to grip. I am not certain how well they would fit an extra large adult hand though. 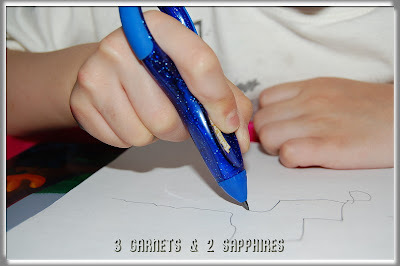 2) Once your fingers are in place, the pencil does not slip at all. You do not have to worry about holding it too high or too low, or even losing your grip on it. 3) Despite their unique shape, I like that these are standard No. 2 pencils. 4) There are two built in erasers . . . one on each side. My son really put them to the test and they did their job well. 5) Needless to say, the 4 translucent and glittery colors that come in each multi-pack are fun for kids. My son wanted to switch pencil colors even though they all wrote with the same result. 6) The pencil tips are retractable when not in use. You can do so just by twisting the bottom of the pencil. 7) I think these pencils would be perfect if PenAgain could figure out how to make them refillable. In the end, I do think that these Twist 'n Write pencils gave my son more control. He did an excellent job writing his name with consistently-sized letters in a straight line on unlined paper. He even had more control as he was drawing with these pencils as well. 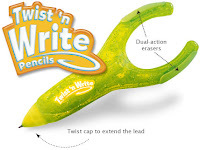 If you think you'd like to try Twist 'n Write pencils, you can find them online at Baumgarten, Amazon.com, Office Max, Office Depot, Staples, CVS, and other retailers where office products are sold. Thank you to PenAgain for providing a review product for us free of charge.